Now in residence at the Brattleboro Music Center , the popular Juno Orchestra is Vermont’s newest professional chamber orchestra, engaging musicians from the tri-state area surrounding Brattleboro. The convergence of a number of felicitous events (secure funding, new performance venue, and planning time) created a particular moment for the Juno Orchestra Project to flourish. 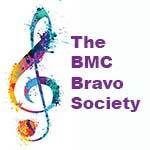 The Orchestra is pleased indeed to find a home at the BMC. The Juno Orchestra Project is a five- to seven-year musical exploration that engages top-flight area musicians and curious audiences. 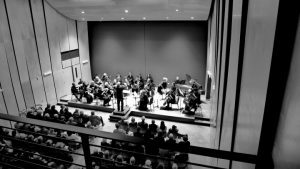 The project creates space and time for an expert chamber orchestra to explore and present compelling known and perhaps unknown works for small orchestra. It features as soloists musicians who received their early training in this area, it commissions or reveals newly composed work, and it adds to the expressive and economic vibrancy of this region. The Juno Orchestra sprang to life in the spring of 2017, under the direction of Zon Eastes and is made possible through the stunning generosity of two remarkable women. About 25 years ago, an adult cello student, Elizabeth (Jo) Dorchester, determined she wanted to make the switch to a more modern cello. When Jo purchased her new cello, built by Marten Cornelissen, luthier in Northampton, MA, she presented Zon with her previous cello, a Peter Wamsley, built in England around 1740. Zon used this wonderful cello for many years in early instrument ensembles. No longer performing so much, Zon has sold the Wamsley to a Dutch cellist in Edmonton, Alberta, Canada. It is moving successfully on to its next career and has provided Juno with a firm financial grounding. Just prior to her untimely death, Zon’s sister-in-law, Sandy Spencer, gave him her primary cello, a modern instrument built by Ray Melanson in Rochester, MA. Sandy’s wonderful instrument is currently for sale. Once sold, Sandy’s generosity will also further the mission of Juno. Jo Dorchester’s inspiring generosity was instrumental in the vision for the Juno Orchestra. Though unassuming and gentle, Jo’s passion for learning – about the cello, yes, but all aspects of music – was heroic. The title Juno Orchestra honors Jo’s name (her name among friends), balances against the male-dominated heavens, recalls the nearly obsolete definition of ‘dear one’, and hearkens toward the explorations of NASA’s Juno expedition to Jupiter and beyond. The dream of forging the opportunity for a professional chamber orchestra to work is now a reality. The Juno Orchestra Project will celebrate the Brattleboro area’s rich musical history as well as amazing assets and, for a time, explore captivating music. The generosity of two wonderful women has opened the path ahead and Juno will celebrate their love of music and community.